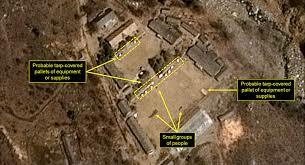 Satellite images show North Korea has taken the first steps toward its commitment to nuclear disarmament. Images show they have begun dismantling a missile-engine test site, fulfilling one of North Korean leader Kim Jong-un’s promises during the historic summit in Singapore in June. The site is believed to play a role in North Korea’s development of liquid-fuel engines, although it’s unclear how much the site’s facilities were still being used. Images published by a leading think-tank on North Korea show activity at the Sohae Satellite Launching Station, located among dense forest and hills close the northern border with China. Workers are believed to be dismantling a building used to assemble space-launch vehicles and a nearby rocket engine test stand used to develop liquid-fuel engines for ballistic missiles and space-launch vehicles, the 38 North think-tank said. The work started at some point in the past two weeks, after the last visit to North Korea by the US secretary of state, Mike Pompeo. White House officials have stated that the trip made by Pompeo to Pyongyang went “as bad as it could have”. Jenny Town, the managing editor of 38 North, which is based at the Stimson Center in Washington DC, said the work at Sohae could be an important move to keep negotiations going. “Since these facilities are believed to have played an important role in the development of technologies for the North’s intercontinental ballistic missile program, these efforts represent a significant confidence-building measure on the part of North Korea,” 38 North said in a report. South Korean officials have also said they detected dismantlement activities at the site, though didn’t specify the exact nature of the activities. The South Korean foreign minister, Kang Kyung-wha, at a briefing in London, said its reports suggested North Korea was preparing for disarmament in return for a lifting of economic sanctions. The satellite image analysis leaves it unclear whether North Korea planned to demolish the entire Sohae site, which has been vital to its space program. Other important facilities such as fuel bunkers, a main assembly building and the gantry tower appear untouched. While the images are encouraging, experts urge caution until the North completely abandons the area. “If North Korea goes further and dismantle the entire Sohae site, that would meaningfully reduce the country’s long-range missile capability by eliminating a facility where it could fire multiple ICBMs in succession,” said Lee Choon Geun, a missile expert at South Korea’s Science and Technology Policy Institute. He added, however, that while the first steps in dismantling the site are important, in reality, Pyongyang is giving up little as it appears the country is content with the current long-range weapons in its possession.